In Money, Greed, and God: Why Capitalism is the Solution and Not the Problem, Senior Fellow at the Discovery Institute Jay W. Richards and bestselling author of Indivisible: Restoring Faith, Family, and Freedom Before It’s Too Late and Infiltrated: How to Stop the Insiders and Activists Who Are Exploiting the Financial Crisis to Control Our Lives and Our Fortunes, defends capitalism within the context of the Christian faith, revealing how entrepreneurial enterprise, based on hard work, honesty, and trust, actually fosters creativity and growth. 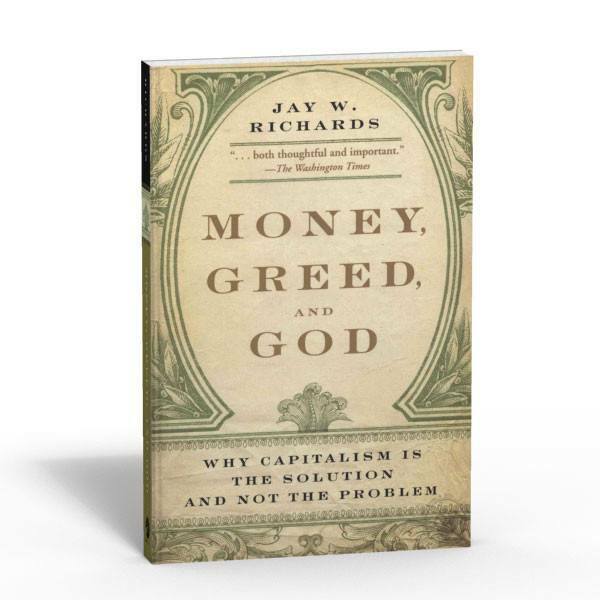 In doing so, Money, Greed, and God exposes eight myths about capitalism, and demonstrates that a good Christian can be a good capitalist. Note: As people, we are too worried about having a lot of things and having the latest thing to impress people. We need to worry more about caring for the poor as opposed to trying to spend all the money that we earn. Note: It is important not to get stuck in a revolutionary rhetoric. This becomes tempting because those who are involved become enthusiastic with their strong words as opposed to having their actions speak for themselves. Note: When it comes to taking responsibility, the government should be the last resort. When it finally reaches the government, the person or problem becomes more generic. This is turn can create more problems. Note: People have had the thought that when it comes to private charities, the government should help so that they have more cushion. However, when the government enters these private places, they tend to change the original mission. Note: Trading, even though the items don’t physically change, add value because the person who receives it desired the item and vice versa with the opposite end. This especially works when there are rules set up beforehand. Note: Labor adds value to a product when it creates something that the person wanted. However, economic value doesn’t come from labor. Note: Relative poorness is being poor in relation to other people. For example, a lot of people would be considered poor in comparison to Bill Gates but can are still well off and still have more than they need. Statistic: 2.46% of people who are considered to be “poor” in the United States actually own their own homes. Only 6% of poor households are overcrowded. Note: There can definitely be greed within capitalism but the system itself does not run on people’s greed. Note: Charging interest has been for many decades considered usury and wrong for Christians to do, there are also some scripture passages that speak against it. The book debunks this theory for modern economics because it looks into the contextual setting of charging interest mentioned in the Bible. Note: It is an easily held belief that capitalism should not be a part of the Christian life. One of the best defenses that the book gave tooth’s kind of thinking was the parable of the talents. This parable clearly puts investing and economic growth as a good thing. Quote: This chapter addressed the idea that capitalism leads to consumerism. Though capitalism encourages market growth and more production with the free economy it cannot determine the hearts of the people within the market. Note: The law of supply and demand can actually save natural resources. If something truly becomes depleted it will become too costly to use anymore in the economy and human invention or alternative sources will replace the original source.